Well, you must be wondering, how in the hell is that even possible. We all know that Gmail has certain restrictions when it comes to sending Emails. And there is a reason for that too. Gmail loves their customer, hence the limits. It doesn’t want you to exploit its services or harass its customers. If some tool or product is promising you that you can learn “how to send 10,000 emails at once using Gmail” or “how to send bulk emails using outlook” or “how to send unlimited of email from your own Gmail address” then they are lying to you. And we won’t do that to you. If you really want to send 100 emails at once or 1,000 emails at once or 10,000 emails at once or even larger number of emails at once, you have come to the right place. Here’s the solution to send 10,000 emails at once. SalesHandy’s mass mailing feature with Automated Follow up lets you schedule (as it is not possible to send so many at the same time) as many emails as possible and yes, we are talking more than 10,000 emails too. And with out limiting it with just Mail Merge from Gmail or Mail Merge from Outlook. SalesHandy does provide the option to configure your email address using SMTP Configurations. So, don’t worry, even if you have other than Outlook or Gmail account you can easily send mass emails for free upto certain limits. Start Sending 1000s of Emails at Once! With SalesHandy, you can have that weight lifted off from your shoulders of sending out bulk emails and following them up. It might take a day or two to schedule those emails and but that is that. You will just have to see your scheduled emails work their magic on your client. Now, you must be wondering how to do that? Let me walk you through the process to send thousands of emails at once from your Gmail email address. With SalesHandy, you have to divide those email addresses with up-to 5000 email addresses in each batch depending upon how many emails you want to send in each mass mailing campaign & in each day. And this can be easily done using macro if you want to send to 20k OR 50k email addresses. (Don’t know macro? Want help to do that? Our support team will help you do that for free). Why 5000 a day? Read more about gmail email sending limits? 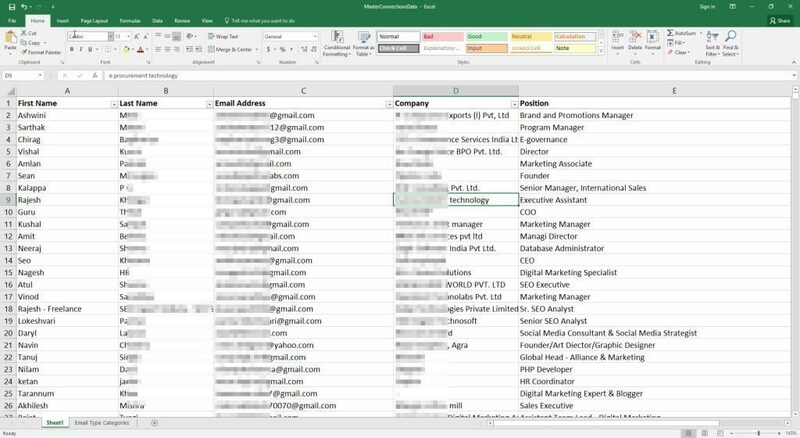 After the batches are done, you just upload the CSV in SalesHandy’s Email Campaign. Once you’ve uploaded the CSV, if you want you can verify and clean the email list to ensure a lower bounce rate using SalesHandy itself. Find the perfect email content to pitch your ideas or message. As well as write the followup emails too which you want to send later if not replied or not opened. Hit the send and schedule button. You are done. You must be thinking that is this just a way to send 10000 email at once and isn’t it really possible to do in a days’ time. It is impossible to send 10000 or more emails from your email address on the go in a single day. So, how about we just tell you the truth. And the truth is, one of our customers is behind this idea of scheduling 10,000-50,000 emails. He is the one who came up with this way of sending out thousands of email at once. Send out 200 emails at once for FREE! Of course, not send, but the schedule. In fact, his goal is to schedule 1,000,000 emails in a year. He has 20 accounts with us and schedules 20,000 emails every single day using all the accounts. In the above picture, you can see 5 scheduled campaigns with 3-4 followup emails scheduled. In our case, we have scheduled only 3 follow up stage, but that is an individual choice. You can easily schedule up to 9 follow stages using SalesHandy. Important Note: SalesHandy also gives you an option to add Unsubscribe link within your email campaign. You can add Unsubscribe tag at each stage of the email campaign so that the recipient can opt-out from your email list. Using this feature, you can send 200, 1600 or 5000 emails in a day depending on your SalesHandy plan type. SalesHandy uses drip method to sending mass emails by putting time interval between two consecutive emails and respects Gmail’s daily sending limit hence giving you a guarantee that any email sent using SalesHandy won’t end up in the Spam box. This feature is only useful when the emails are not time sensitive. It doesn’t matter how many campaigns you do in a day SalesHandy will track each and every one of them. Remember, it will take half an hour or so to get the hang of it and the advantage of it will last lifetime. Here is the detailed guide on “How to use Mail Merge and Automated Follow Up”. Here is the link to video guide. You can Install SalesHandy’s Chrome plugin for individual Email Tracking, Scheduling, Link tracking from here.